A new study in the New England Journal of Medicine is shining a light on the risky practice of scheduling Cesarean births too early, the ">Los Angeles Times reports. Researchers said thousands of women put their babies at needless risk of respiratory problems, hypoglycemia and other health problems when they deliver via elective C-sections at 37 or 38 weeks. These deliveries had up to four times the risk of complications compared to C-sections done after 39 weeks. The study showed delivering via C-section even one to three days shy of 39 weeks had a significantly higher risk of health complications. However, the experts also noted that the rate of problems rose again for babies born at 41 and 42 weeks—suggesting that there's a narrow window for deliveries to achieve the best possible outcome for newborns. 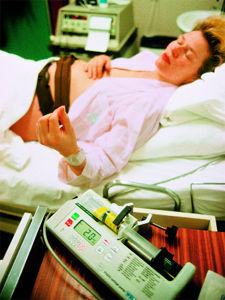 These new findings add to the concerns raised in an earlier Crib Notes about too-early C-sections. According to federal figures, C-sections now account for one-third of U.S. births; an additional one-fifth of newborns arrive via induced labor. C-sections can also pose risks for mom, which we've discussed in the past. However, a C-section is just a must in some cases—after all, there's more than one way to birth. Even if you're not planning on having one, make sure you read up on what to expect after a C-section (just in case!). Interested in what it's like? Check out a Fit Pregnancy editor's behind-the-scenes video at the C-section delivery of her twins!